From a certain moment on, that is about 40,000 B.C., our ancestor, who, now, has evolved in Homo Sapiens-Sapiens, leaves the African equatorial forest and spread about everywhere on the planet except for the Antarctic zone. 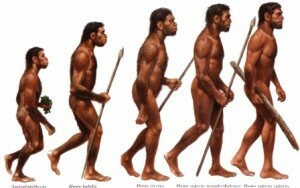 The process of colonizing the earth completes about 10,000 B.C. According to a great virologist in this precocious phase of the human existence, from the beginning of the Pleistocene till 10,000 B.C.,infections caused by microorganisms that had adapted living on man, were nearly inexistent. Only when agriculture supplanted food harvesting and larger and permanent communities replaced small roaming bands, a viral infection that had been got casually, found an opportunity for extensive transfers to other individuals and for its developing into a specifically human disease. As usual things aren’t so simple, but the fact is that also the first great epidemics appear with the origin of the first cities. They are caused by pathogenic agents at high transmissibility and high virulence: the result is the spreading of the disease in few days and a great number of dead people. 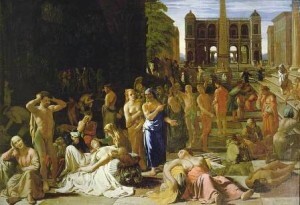 One of the first examples is the so called “plague” of Athens in 429-430 B.C., told by Thucydides. It started in Ethiopia and after passing through Egypt and Libya it reached the Piraeus, the port of Athens. From there it headed for the city where it killed one fourth of the population. We don’t know what kind of disease it were, somebody supposes it were measles. The correlation between transmissibility and virulence, according to which the more a microorganism (virus particularly) becomes transmissible the more its virulence increases, isn’t admitted by everybody, but the fact is that big epidemics start just when the first large urban conglomerations rise and will always find their epicentre in big cities. So Titus Livy tells about the epidemic that broke out in Rome in 387 B.C. and there was another one in 65 B.C. But they both were very little if compared with Antonino’s plague of 165-180 A.D.; it had been brought to the Mediterranean sea by the troops that had fought in Mesopotamia and caused the death of one third of the whole population of the empire. Maybe it was a smallpox epidemic. Another of the human actions which favoured the development of infectious diseases was the rapid moving of large masses of people from one point to the other of the earth, above all the big overcrowding there was everywhere the armies went. Too many are the examples similar to the ones above mentioned because we can deny the close connection of casuality between overcrowding and epidemics. On the other hand in lab mammals for the only reason density is increasing, without neglecting all the other conditions (food supply -cleaning-temperature) mortality rate for diseases increases. Overpopulation and movement favour the environmental contamination and the transmission of pathogenic agents. 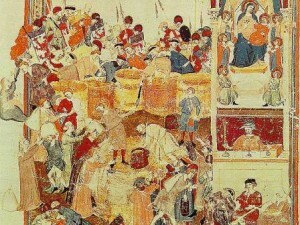 With the process of civilization large masses of people were more and more linked to the result of harvests and when the latter were scarse in famine times, without the necessary support a large part of the population became an easy prey for viruses and bacteria. 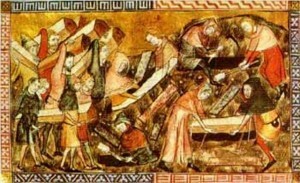 War, famine and epidemic became, over time, the three factors regulating human population, factors that are the same of the painful assessments Ezekiel, the prophet, tells about in the Bibble: the sword(war), the famine, the plague(epidemic); the fourth, the wild beast(predation), had long time before stopped working for man. An example of how ruinous for civilization war, famine and epidemic may be when they act in synergy, happened under the Emperor Justinian. In only two years 542-543 A.D. there was a very high mortality since the three events took place simultaneously. Plague epidemics. The epidemic was probably a bubonic plague and the human species decreased so much that in some remote regions of the globe it is still perceived. Thucydides La guerra del Peloponneso. BUR 1994 Milano. Shreewbury J F D. The plague of Athens Bullettin of the History of Medicine(XXIV)!950 pag.1-25. According to many scientists if the transmissibility of a virus(or a bacterium) is facilitated, it becomes more virulent, because even if the host falls ill and dies shortly after, the frequency of the contacts which favours the transmissibility, allows the microorganism(virus or bacterium) to pass to a new host before the original host dies. 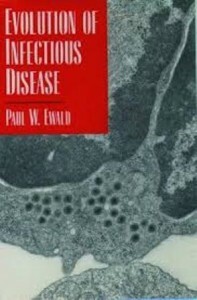 Ewald P W. Evolution of Infectious Disease Oxford University Press 1994. Titus Livy Ab Urbe Condita VIII, 18(Storia di Roma dalla sua fondazione. Classici della BUR. Vol. IV pag.53-5 1980). David Lack The factors limiting mammals. In The natural regulation of animal number. Pag.177 Oxford at Clarendon Press 1954.